North Finchley is an increasingly desirable area of London with fantastic connections to the city centre. A pleasant suburb of the North London Borough of Barnet, it’s popular with young people looking to buy their first home, as well as families. There is a wide range of property in North Finchley, the majority of which are period properties towards the east of the area. However, for those homebuyers who are looking for a modern apartment, there are not as many options. Fortunately, we are currently in the final stages of completing work on eight 1 and 2 bedroom apartments on the popular road, Friern Park. This contemporary development – Rosebay House – is perfect for people looking to get on the property ladder, and is available through the government’s Help to Buy Scheme. Why Move To Friern Park, North Finchley? Friern Park is an attractive residential street with a variety of different style properties. There are local shops, bars and restaurants a short walk away, providing entertainment and shopping opportunities on your doorstep. Woodside Park Underground Station is nearby, with a journey time of approximately 20 minutes into central London on the Northern Line. Also close by is Friary Park, which has gardens, sports facilities, children’s play areas, open spaces and a café; making it a popular destination at the weekend and on summer evenings too. Our modern Friern Park development – Rosebay House – is perfectly situated to access all local amenities and each home benefits from its own outdoor space and parking. Surrounded by period villas and green spaces, this is a fantastic opportunity to buy in a vibrant, affluent community. Each apartment will be finished to a high specification, with Villeroy and Boch sanitaryware, high gloss kitchen units with quartz worktops and upstands, Siemens appliances, Amtico flooring and many other desirable features. Homebuyers will also have the opportunity to customise their apartments with various colour choices if they buy off plan. 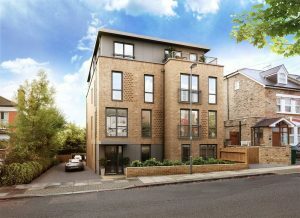 Troy Homes are holding a preview event at Statons Estate Agents in Barnet this March to showcase this exciting development, and register your interest. The HCA equity loan gives homebuyers some much-needed breathing space as they won’t be charged fees on the 20% loan for the first five years of owning their new home – perfect for the first time buyer! Rosebay House is fantastic opportunity for anyone who meets the qualifying criteria, to find out if you do please contact us today or attend the preview event in March. There are only eight apartments available, six with 2 bedrooms, two with 1 bedroom, so don’t miss out. Register your interest here.